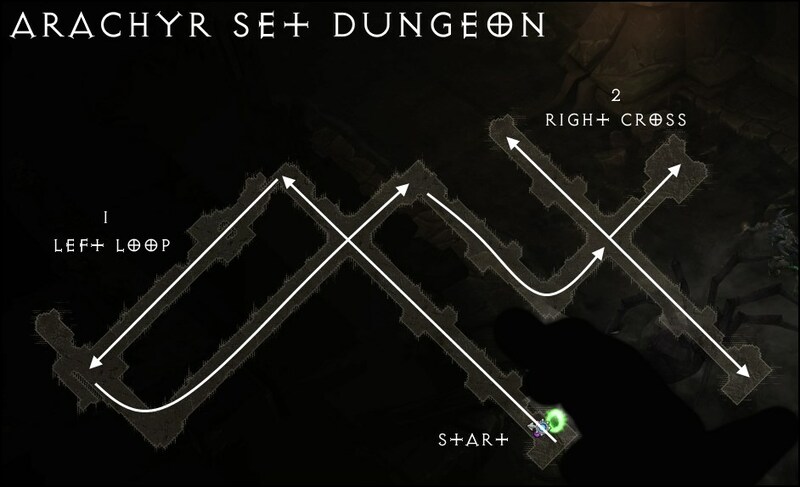 Beating Arachyr's Set Dungeon: info on Build, Map and Tips to clear and MASTER the of the Arachyr's Vengeance set dungeon! Hey guys! Welcome to our Witch Doctor’s The Arachyr’s Spirit Set Dungeon Guide. Here we will talk about what build to use, skills, items, notes, map and more! Boots Arachyr’s Stride Pierce the Veil Swampland A. The “any” slots are irrelevant and can even be yellows. There’s no “must” in that slot. Thing of the Deep: the only helpful item. It gives you CDR via Grave Injustice. In that note, CDR is welcome in any form. It’s unlikely you’ll be ‘too powerful’ – PILE ON THE PAIN!!! 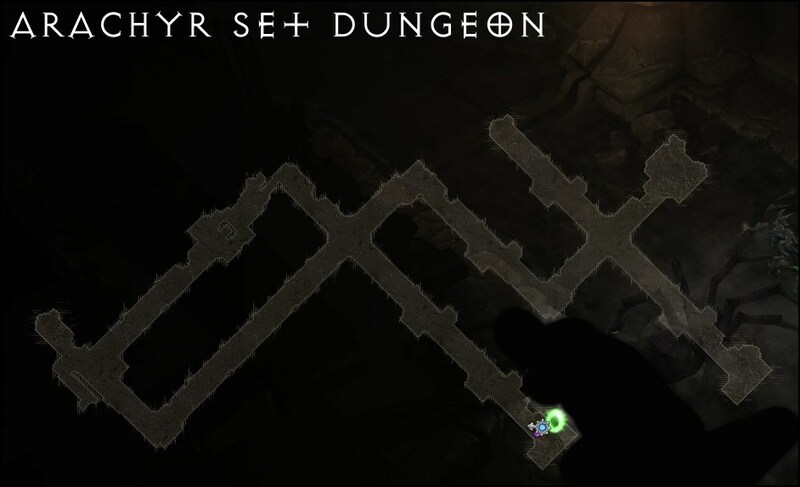 Where is the Arachyr’s Set Dungeon? It’s in ACT II – Dalghur Oasis. Teleport to the way-point ACT II – Dalghur Oasis. Just go down and left, trying to find the edge of the map. In a tiny alcove you’ll find the entrance! This one shouldn’t even take 3 tries to master… one of the easier ones! Familiarize yourself with the map first. A sample path is shown above. Start off and go all the way forward until you’re forced to bust a left. Complete this small rectangle and you’ll eventually find yourself at a crossroads. There’s three paths here… straight, left and right. Go right, backtrack, go up, then finally finish off with the left path. I wouldn’t be surprised if you didn’t know how the Toad rune works before this, certainly I didn’t! Once you use it, it’s easy to understand. Your power level greatly affects the toad lick speed. Since it won’t stop licking a dude until it dies! Naturally, the lick itself can outright kill if you’re strong enough, greatly reducing the time you need to get this done. Help it! Toss your Corpse Spiders (which in turn tells your Queen spider to go there) and assist in the killing of the current licking victim, so it can move to the next. It’s a balancing act managing how fast you need to go, and how many Toad licks you need to do. Grave Injustice greatly helps here, and any other source of CDR. Multiple Toads can be active, and you should be continually moving and putting Toads out. Don’t worry about stragglers, the Toad should be able to easily kill anything in its range. Objective: Kill elites while Webbed + Piranha-d! The process for this is quite simple. Throwing Corpse Spiders on it continuously will web it. Now it just has to die while it’s being eaten by Piranhas. I don’t know if Creeping Death worked for this regard but either way I beat it with or without the passive. Just make sure you cast the fishies before it dies! Check our our D3 Guide Directory for anything else you might need! The Arachyr’s Spirit Set Dungeon ain’t hard at all! Toadally doable. Like us on Facebook for more D3 updates! Want to help us out? Check out Patreon for more details! Thanks again for the guide 🙂 Made this incredibly easy and I look forward to using the rest of your run-throughs to carry me to greatness! Wow, last time I tried a set dungeon was when they first came out and I found them almost impossible. I just followed this guide on my witch doctor and succeeded on my first try without much effort at all. Awesome! Simply remove some pieces of gear or use a worse weapon! Yep – some of these set dungeons punish you for being too strong lol.